This year, a truly “Victorian” Christmas is featured at Windsor Castle, including a Christmas tree hanging from a ceiling in a recreation of Queen Victoria’s Christmas celebrations. This practice is reminiscent of the holiday display in 1860, when a visitor to the castle said the decorated rooms “were lighted up with Christmas trees hung from the ceiling, the chandeliers being taken down. These trees…were covered with bonbons and little wax colored lights; some of the trees were made to appear as if partially covered in snow.” Because almost anything young Victoria and Albert did became the rage, many of their holiday celebrations and Christmas trees were documented in contemporary prints and paintings. 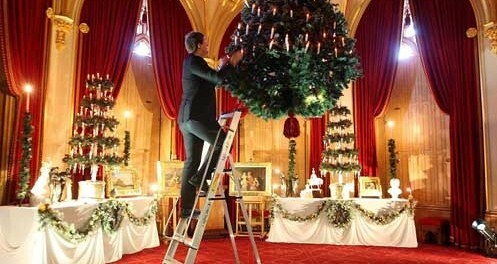 Learn about Victorian Christmas trees at Windsor Castle. Christmas celebrations in a Victorian mansion. Featuring images of Christmases in English middle-class homes.